Wayne Ellington set a Heat record with 227 3-pointers last season, and established career highs of 11.2 points and 26.5 minutes per game. 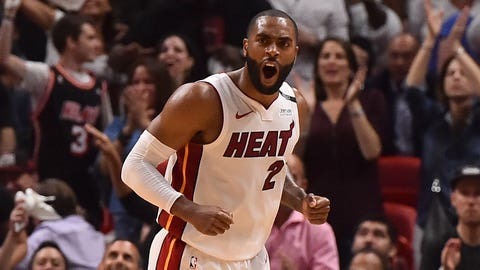 LAS VEGAS (AP) — Wayne Ellington is returning to the Miami Heat, after nearly two weeks of waiting and wondering if he would get his wish to be back with the club for a third season. A person with direct knowledge of the terms said Thursday night that Ellington accepted a $6.3 million, one-year offer that exactly matches his salary from last season. The person spoke to The Associated Press on condition of anonymity because the contract has not been signed. Keeping Ellington was a top priority for the Heat this summer, and the veteran guard made clear that he wanted to be back in Miami. On Day 12 of free agency, a deal finally got struck. Ellington set a Heat record with 227 3-pointers last season, and established career highs of 11.2 points and 26.5 minutes per game. When he was good, Miami was really good a year ago. Ellington appeared in 77 games — the Heat went 29-13 when he made at least three 3-pointers, and went 13-22 when he failed to connect on at least that many. And he made it clear many times, both during the season and even in the offseason, that he wanted to remain with the Heat. Miami was the No. 6 seed in the Eastern Conference playoffs last season, falling to Philadelphia in the first round. Miami’s roster, for now, is fairly similar to what it was last season — though the Heat are still waiting to see if they will be bringing back veterans Dwyane Wade and Udonis Haslem, two players whose status for 2018-19 remains unclear. Miami is Ellington’s seventh team, and just the second club that he’s been with for 100 games. He was changing addresses annually for a five-year stretch before arriving in Miami — his career started with three seasons in Minnesota, followed by short stints with Memphis, Cleveland, Dallas, the Los Angeles Lakers and Brooklyn that preceded his signing with the Heat in 2016. “I feel like this is home now,” Ellington said.